Explore an exciting world of career and employment opportunities in psychology. There are a number of dynamic, rewarding careers in the field of psychology that involve working with children. Explore the opportunity. Is a psychology career right for you? The short answer is, it depends. Explore the advantages and disadvantages of a career in psychology. Several fields of psychology are growing at a phenomonal rate and jobs are plentiful. Explore the fastest growing fields in psychology. While a graduate degree is typically required to become a psychologist, there are a myriad of career options for those with a bachelor's degree in psychology. Explore the differences and similarities between psychiatry and psychology. While competition is intense, psychology grads can look forward to good job prospects. Review some of the most frequently asked questions about a career in psychology. Ready to start your own practice? Explore the pros, cons, dos and don'ts of starting your own psychology practice. This section of our site is designed as a resource for aspiring psychology students and graduates seeking career information, education, job search, and licensure assistance. Aside from a few Google Ads, all resources on this page are non-commercial in nature and free to use in any way you find beneficial. Please contact us with any other resources you'd like to see added to this page. To learn more about advancing your career in psychology select a topic below. Search our database of online and campus-based psychology degrees and programs. Earning a bachelor's degree in psychology is the first step to a career in psychology. However, many positions now require either a master's degree or Ph.D. in psychology. Psychology is to study mental processes and human behavior through researching, observing, analyzing, and interpreting how individuals and other living creatures relate to one another and their environment. Like other social sciences, psychology revolves around the formulation of theories, or hypotheses, which are intended to explain what is observed. But unlike other social science disciplines, psychologists often concentrate on individual behavior, more specfically in the beliefs and feelings that influence a person's thought patterns and ultimately their actions. Psychology is truly a very diverse field that provides a plethora of career opportunities for qualified professionals. Psychologists perform a large variety of duties in a number of diverse industries. For example, psychologists working in the field of health services may provide mental evaluation and healthcare services in clinics, hospitals, schools, or in the private sector. They may also be employed in applied settings, including industry, business, nonprofit organizations, or government, providing training, conducting research, designing organizational systems, or acting as advocates for psychology. One of the factors that many psychologists will tell you prompted their decision to pursue a career in psychology was their desire run their own business. Today, nearly 34 percent of psychologists are self-employed, mainly as private practitioners and independent consultants, which is four times the national average for all other occupations. While psychologists apply their knowledge and skill in a vast range of endeavors, including human services, healthcare, education, management, sports, and law, they usually focus in one of the specializations listed below. Psychology offers occupations and career opportunities in a diverse array of specializations. Obtaining an education in psychology will prepare you for career opportunities in counseling and closely related career fields. Explore various career opportunities in social work and closely related specializations. Therapy is a popular and growing career field that offers opportunities for psychology students and therapists. Psychologists held about 166,600 jobs in 2016. This is an increase of 4 percent from the 2012 number of 160,200. Educational institutions employed about 32 percent of psychologists in positions other than teaching, such as counseling, testing, research, and administration. About 32 percent were employed in healthcare, primarily in offices of mental health practitioners, hospitals, physicians' offices, and outpatient mental health and substance abuse centers. Government agencies at the State and local levels employed 10 percent of psychologists in correctional facilities, law enforcement, and other settings. Between 2012 and 2020, employment of psychologists is predicted to increase by 18,700. And between 2016 and 2026, the prediction is an increase of 23,000 jobs. These numbers reflect the latest government job data as of 2019. After several years of experience, some psychologists—usually those with doctoral degrees—enter private practice or set up private research or consulting firms. About 24 percent of psychologists were self-employed in 2016—mainly as private practitioners. In addition to the previously mentioned jobs, 46,700 psychologists held faculty positions at colleges and universities in 2016. Additionally, many psychologists are employed as high school psychology teachers. 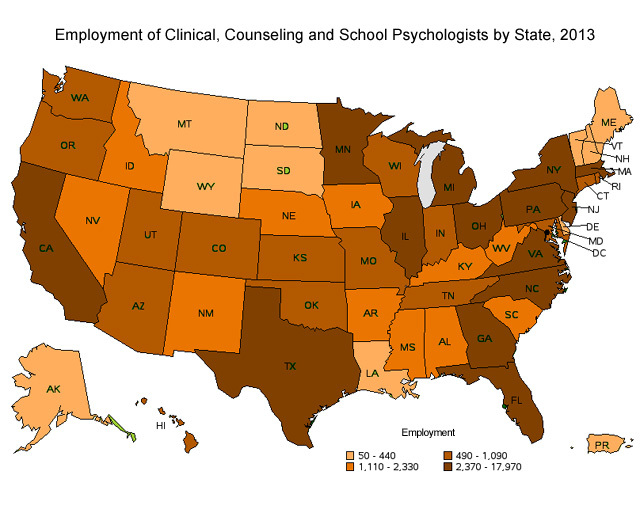 Below you'll find states employing the highest number of psychologists as of 2019, along with the number of psychologists employed, employment per thousand jobs, and location quotient. These numbers include postsecondary psychology teachers but exclude the self-employed. (The location quotient is the ratio of the concentrations of psychologists employed per geography to the national average concentration. States with a location quotient greater than one employ a higher number of psychologists than the national average. A location quotient less then one indicates the state employs a lower number of psychologists than the national average.) The location quotient is a useful figure that should be considered when seeking employment opportunities and deciding where to set up a private practice. We've also include basic wage information for comparison purposes. The chart below shows those states with the highest concentration of psychology jobs. Source: Burueau of Labor Statistics. The largest employment sector within the field of psychology is made up of clinical, counseling and school psychologists. The mean average pay for this group of psychology professionals was $81,330 as of 2019 according to the Bureau of Labor Statistics. 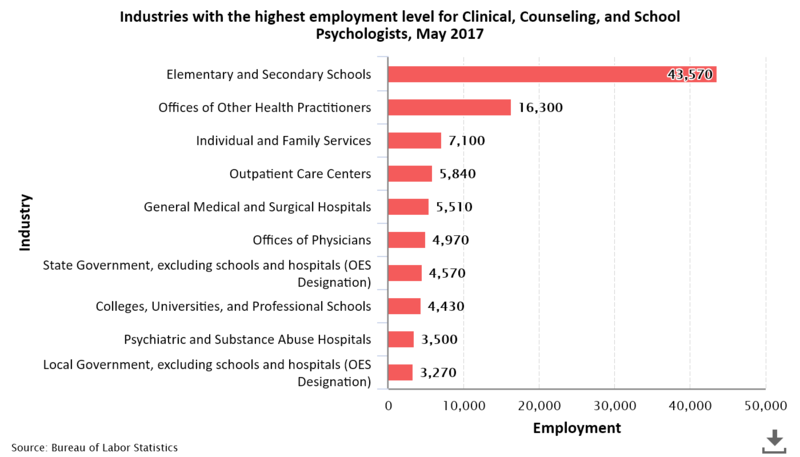 Annual projected growth of clinical, counseling and school psychologists is estimated at 14 percent between 2016 and 2026, twice as fast as the average growth rate for all other occupations in the United States. 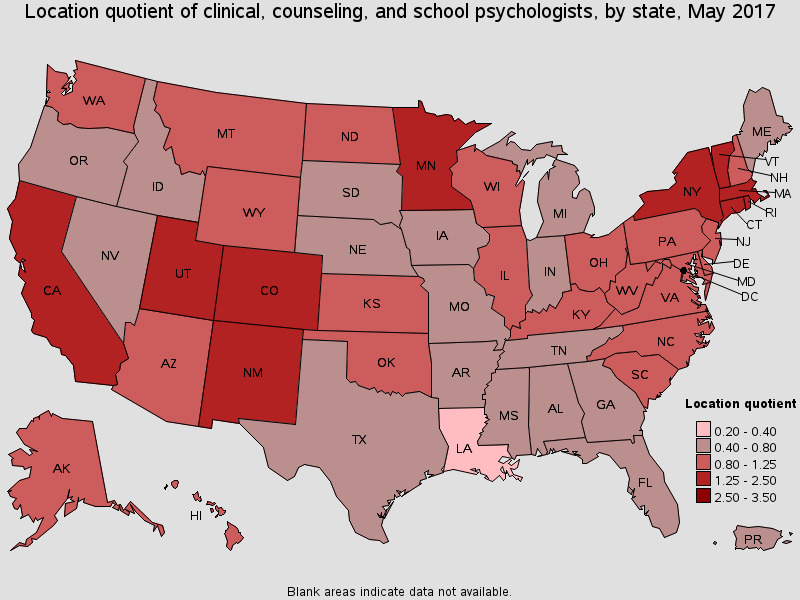 The chart below shows the states that employ the highest number of clinical, counseling, and school psychologists. This is useful information when determining where to look for employment or set up your own practice. Dividing the total employment numbers per state below by the total population of the state will yield a psychologist-to-individual ratio. This ratio is also helpful when assessing employment opportunities. 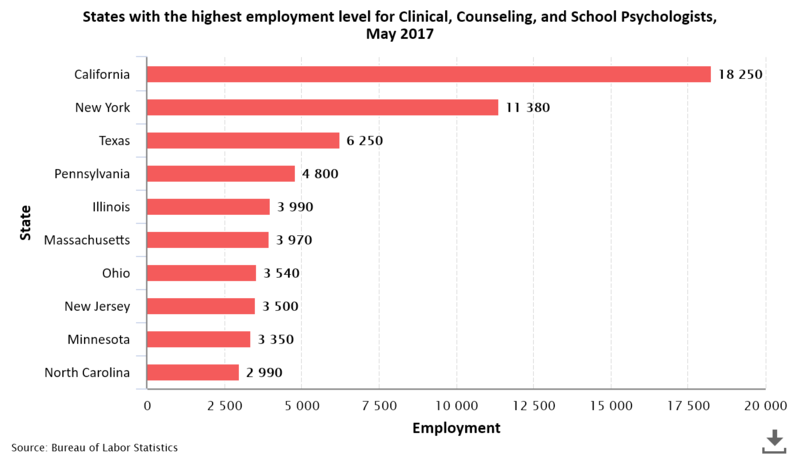 The chart below shows the industrie that employ the highest number of clinical, counseling and school psychologist as of 2019. This is useful information for students and job seeker considering employment opportunities. 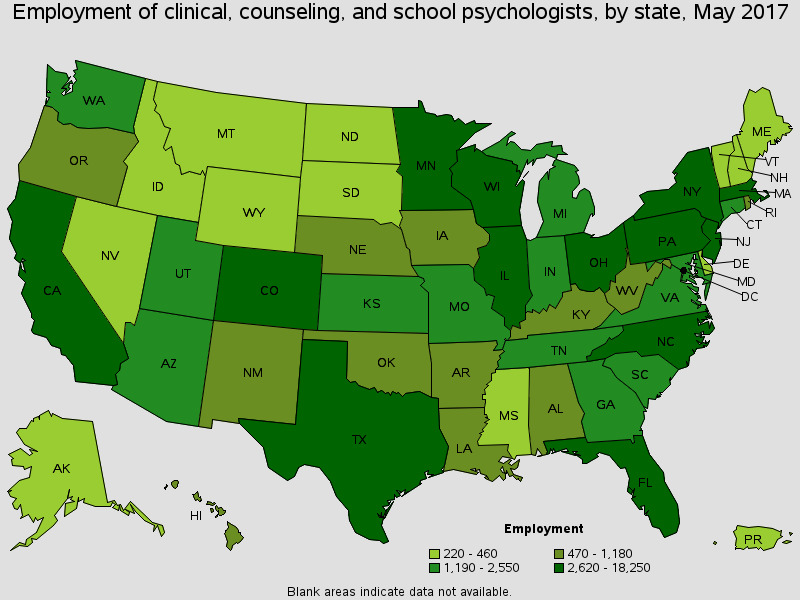 Directly below is map we generated using 2013 state employment data for clinical, counseling and school psychologists provided by the U.S. Bureau of Labor Statistics. 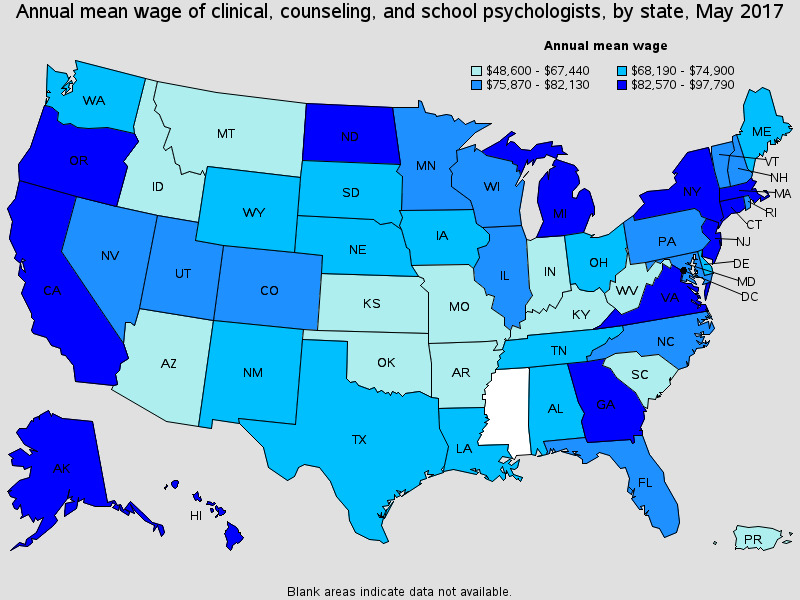 Directly below is map of the annual mean wage with most recent 2019 data for clinical, counseling and school psychologist nation wide. Comparing the map below with the map above can help you get a good idea for employment potential in each state. Employment opportunities for psychology professionals are expected to grow as fast as average for all other occupations in the United States through 2026. Job opportunities will be best for individuals with a doctoral degree from an accredited university in an applied specialty, such as health or science, and for those with a specialist or doctoral degree in school psychology. Master's degree holders in fields other than industrial-organizational psychology will likely face high levels of competition. Career opportunities will not be as plentiful for bachelor's degree holders, although some entry-level opportunities will exist. Individuals with a bachelor's degree in psychology will likely pursue career opportunities in fields other than psychology. Employment change. Employment opportunities for psychologists and other psychology professionals is expected to grow 14% from 2016 to 2026, about as fast as the average for all other career fields. Employment growth will be due to increasing demand for psychological services in hospitals, schools, social service agencies, substance abuse treatment clinics, mental health centers, consulting firms, and private companies. If you're looking for a job these industries are a good place to start your job search. An increasing demand for school psychologists will be generated by growing awareness of mental health and behavioral problems, such as bullying, as they relate to students ability to progess and learn in an educational enviroment. School psychologists will also be required to fulfill general student counseling on a variety of other issues, including working with disabled students or with special needs students, addressing drug abuse, and managing and consulting personal crisis. Ever rising healthcare costs associated with unhealthy lifestyles, such as alcoholism, smoking, and obesity, which have made prevention and treatment more critical, will continue to spur demand for qualified clinical psychologists. A growing number of employee assistance programs, intended to assist workers with personal problems, also should lead to new employment opportunities for a variety clinical and counseling specialties. A growing number of clinical and counseling psychologists will be needed to help people productively cope with job stress, depression and other mental disorders, marriage and family problems, as well as a variety life altering addictions. An increase in the elderly population will increase the demand for psychologists trained in geropsychology to help people cope with the physical and mental changes that occur as individuals grow older. Forecasts indicate that there will also be a growing demand by the public and private sector for psychologists specially trained to work with returning veterans. Industrial-organizational psychologists and related psychological specialties who are equiped to boost worker productivity and retention rates in a wide range of businesses will among those psychologists in highest demand. Industrial-organizational psychologists will also be hired to help companies and organizations deal with issues such as antidiscrimination policies and workplace diversity. Psychologists' with expertise in survey design, analysis, and research, capable of design tools for marketing evaluation and statistical analysis will find job opportunities to be plentiful. Job prospects. Job opportunities will be most plentiful for professionals who have a doctoral degree from a top university in an applied specialty, such as heathcare or counseling, and those with a specialist or doctoral degree in school psychology. Psychologists who have work experience or extensive training in quantitative research methods and computer science are predicted to have a competitive advantage over applicants without comparable training or experience. Psychology professionals with a masters degree in fields other than industrial-organizational psychology are likely to face steep competition for jobs because of the limited number of positions that require only a master's degree (most requiring both a masters degree and doctoral degree.) Those candidate who possess a master's degree will find jobs as psychological assistants or counselors, providing mental health services under the direct supervision of a licensed psychologist. Still, other psychologists may find career opportunities involving research and data collection and analysis in government, universities, or private companies. Job opportunities directly related to psychology will be not be as pentiful for bachelor's degree holders as most job candidates will possess both a bachelor's degree and post graduate degree. Bachelor degree holders will likely find jobs as assistants in rehabilitation centers or in other positions involving research, data collection and analysis. Psychology professionals with a bachelors degree who meet State certification requirements may become high school psychology teachers. 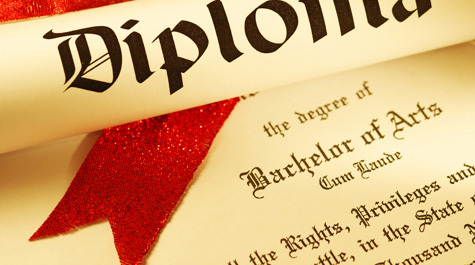 Many professionals who hold only a bachelor's degree in psychology will pursue job opportunities in other industries. As of the latest government data provided in 2019, the median annual wage for all psychologists was $77,030 according to the U.S. Bureau of Labor Statistics. During the same time period about half of all psychologists made between $55,000 and $100,000 a year. The lowest 10% of psychologists make less than $43,000 a year, while the upper 10% made over $120,000. The map below shows the mean annual wage for all psychologists by state. Those states that are blank indicate that data is not available. (Note: the mean wage is the middle wage. 50% of all psychologists will make more than the mean wage, while 50% will make more. 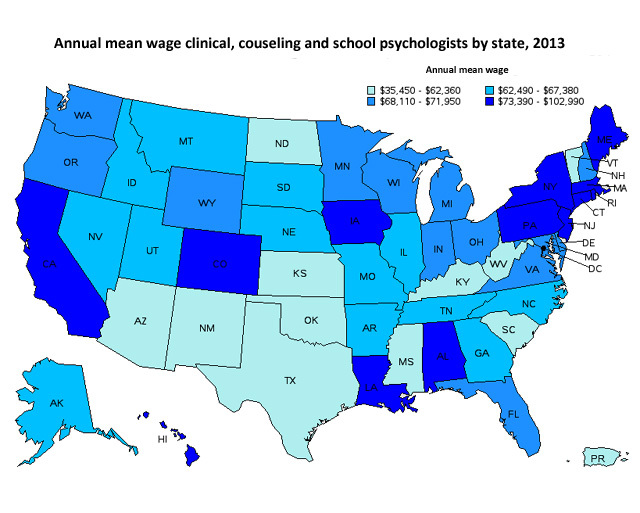 The map below shows the mean annual wage for clinical, counseling and school psychologists by state as of May 2013. 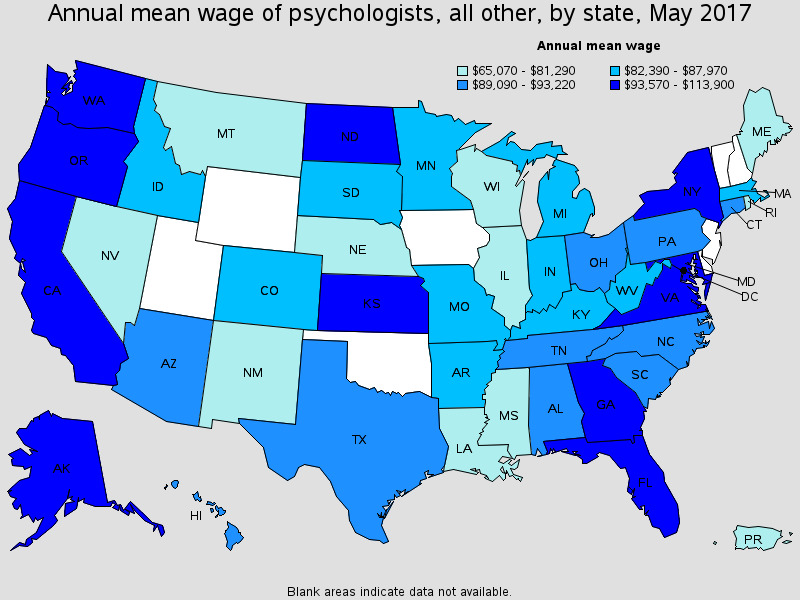 Below are the wage figures by state for psychologists as of 2019. These data include both annual wage and hourly pay figures. While figures for individual psychology disciplines by state are not available, the numbers below will provide you a very good idea for the earning potential in one state relative to another. We also recommend comparing the wage figures below to the average cost of living for each state listed. There are several factors, including location, experience, education level and industry, that impact earning potential for psychologists. You can find more earnings information for individual disciplines on our psychologists salary and wage information page. Any psychologist who has a private practice, or provides services directly to patients, must fulfill specific licensing and certification requirements mandated by state and federal law. These requirements vary, depending on the state you live/work in and your specific area of focus (clinical, counseling, school, etc.). In the end, it's your responsibility to know the requirements for your particular situation. A state license is essentially a seal of approval, verifying that the psychologist is sufficiently trained and capable of providing effective services to his or her clients. Typically, state licenses only allow psychologists to practice within the realm of their training and education. 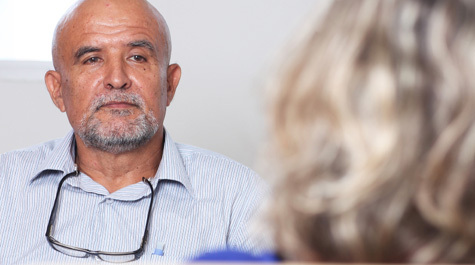 Clinical and counseling psychologists are usually required to hold a doctorate degree in psychology before being considered eligible for licensure. After earning a doctorate degree, psychologists must pass a standardized licensing exam, which is administered by their state licensing board. This exam may consist of multiple choice questions and/or essay and verbal response sections. Once again, these requirements vary from state to state. It is not uncommon for psychologists to be required to undergo a two-year internship or residency, as well as passing the exam before becoming eligible for licensure. Below you'll find licensure information for other specialties. The psychology job search resources below have been compiled, reviewed and evaluated by our editorial staff for relevancies and usefulness. If you know of any other reputable job search resources for aspiring psychology students and psychology graduate we'd love to add them to this section.